O'Connell Street in Dublin during a protest in solidarity with Palestine. AN ISRAELI MINISTER has called on AIB to close the Irish accounts of Palestinian protest groups. The Ireland Palestine Solidarity Campaign (IPSC) said it was shocked to learn that Israel’s Minister for Strategic Affairs, Gilad Erdan, directly appealed to AIB to close the Irish accounts of those who are lobbying to boycott Israeli goods. Many of those accounts belong to the IPSC who said it was appalled to learn that the Israeli government was openly talking about putting pressure on AIB to shut the accounts. The same paper said that Ireland is considered one of the most hostile nations to Israel in western Europe. BDS stands for boycott, divestment and sanctions. It is a movement which works to end international support for Israel. TheJournal.ie yesterday contacted AIB and asked if it was lobbied by the Israeli government. We also asked if the lobbying exerted pressure on the bank to close certain accounts. No AIB accounts connected to the IPSC have been closed at this point. Back in 2016, the IPSC formally complained to Bank of Ireland after it shut down its bank account. The account was used to store money it had gathered through fundraising. It is also currently using the AIB account to store donations. The group, which was set up in 2001, had been using a Bank of Ireland account to lodge donations. The IPSC said it uses to the money to reach its aim of highlighting struggles faced by those living in Palestine. 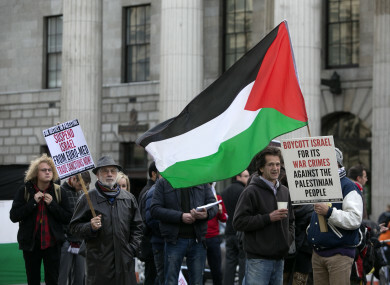 The group said the Irish government needs to do more than just express its support for the right to “campaign against Israeli injustices; it needs to act to protect civil society groups who are at risk and to ensure they can operate in a healthy democratic society”. In January of this year, the IPSC was named as one of 20 Palestinian human rights advocacy groups that are banned from entering Israel, and thus banned from visiting friends and colleagues in Palestine. Email “Israeli government minister called on AIB to shut down Irish pro-Palestine accounts”. Feedback on “Israeli government minister called on AIB to shut down Irish pro-Palestine accounts”.